The Nexus Odyssey is an omnibus featuring the Darwinian Extension series along with the follow-on novel "Renewal", a series that presents a bold vision for the human race. It begins in 2033 with a planned mission to populate the red planet, Mars. But rather than a simple plan to create a settlement as the private company Mars One is working towards in 2023, the idea is to colonise the planet and ultimately terraform the surface creating a viable biosphere. This could then be settled and alleviate the overcrowded, resource depleted planet Earth. A team is hastily assembled consisting of commander Magnusson and Doctor of mathematics Banjani as first officer. 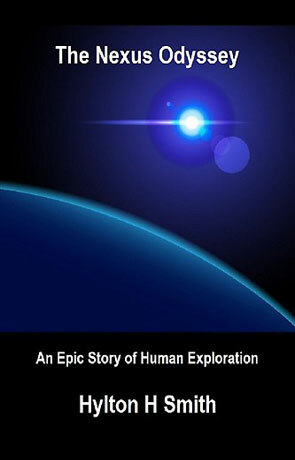 When they get to Mars they make a startling discovery that will change humanity forever. Transition begins five years after the crew of the spaceship Copernicus make the discovery that humanity is not alone and their return has caused a huge uproar on Earth. Political and religious upheaval is met with incredible advances in technology. Eventually this upheaval brings with it a new form of government that discards the consumerism and commercialism of the past. Friction remains however between the two planetary colonies, a fraction that grows deeper with a second discovery on the red planet. Completion begins 20 years after the original Mars mission and the terraforming has produced a thin, breathable atmosphere and a warmer temperature that helps the 50,000 or so inhabitants that now populate the planet. Relations between Mars and Earth are still fractious however and a renegade nation on earth is determined to built a nuclear presence, threatening the fragile peace between worlds. Technological advances continue including a breakthrough in the development of an Interstellar craft along with research into physiological modification needed to survive such a journey. Renewal tells the tale of such an interstellar craft, the Phoenix - a colossal space ship which is on its 43rd year on a journey to the 55 Cancri system - a binary star system 41 light-years from Earth that has at least 5 confirmed planets orbiting the twin stars. Collectively these novels make up the The Nexus Odyssey, an epic tale of humanity's first steps into the cosmos and our first contact with alien races. The style of these books is very much like those of the "Golden Age" science fiction authors, not least that of Arthur C Clarke and this includes a strong sense of "futurism", firmly placed within the "hard scifi" sub genre. In many respects it's a spiritual successor to Clarke's Odyssey - taking the ideas presented within that classic to their logical conclusion and moving far beyond that original idea. The protagonists are reassuringly human which provides an effective counterpoint to the very "alien" aliens and there has been a great deal of thought into creating races that seem completely "viable" and believable. The books are considerably technical in nature and while all of the technology is perfectly feasible and much does seem along the futuristic style this does mean that the serious is best suited for those who like hard science fiction novels. There are countless great ideas packed into the books, some of which have already been proved likely while the story itself has a powerful sense of the epic, a strong series that is even more effective collected together as an omnibus. Written on 21st May 2013 by Ant.